Starting with the Spring 2017 semester, the Mandatory Course Entry Quiz (formally called Mandatory Course Entry Survey) will be moved from Blackboard to Canvas – FAU’s new Learning Management System. You are required to complete the Mandatory Course Entry Quiz for ALL courses. The disbursement of several Title IV funds (examples include Pell Grants, SEOG, and Federal Work Study) will be restricted to courses where your course entry is confirmed. These funds cannot be disbursed for enrollment in courses where your course entry is unconfirmed. You will confirm your course entry by completing the Mandatory Course Entry Quiz. The quiz will be available on Canvas during the designated drop/add period for each course. During the drop/add period for your courses, you will be sent an email from Canvas listing all your courses for which the Mandatory Course Entry Quiz is available but not completed. The email will contain hyperlinks directly to each incomplete quiz, allowing you to easily complete the quiz from your smart phone, tablet, or computer. If you are a current financial aid recipient or you think you may need financial aid at some point during the semester, you MUST complete the Mandatory Course Entry Quiz for each registered course. 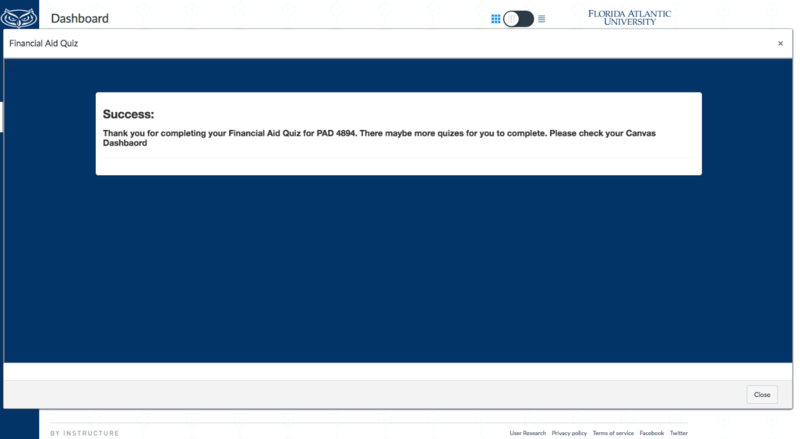 Failure to complete the quiz for any of your courses could result in a reduction/cancellation of your financial aid. NOTE: Quizzes for courses which have a start/end date that is different from those specified in the University Academic Calendar (such as Fast Track and Executive Education classes) will be made available during the courses’ unique drop/add period. Disbursement of financial aid that is contingent on courses which have not yet started will be delayed until you have completed the Mandatory Course Entry Quiz for the course. 1. After logging in to Canvas, you will land on your Canvas dashboard page..
2. In the upper right hand corner of your Canvas dashboard page you will see a listing of quiz links where the Course Entry Quiz has started (note: quizzes which have not yet started will not be displayed). Course Entry Quizzes which you have completed will have a GREEN CHECKMARK next to them. Course Entry Quizzes you have not completed will have a RED "X" next to them. To complete the Course Entry Quiz, click on the quiz link on the right to enter the quiz. 3. After entering the Course Entry Quiz for the course, you will be presented with the following quiz question below. Respond to the quiz question and click the SUBMIT button at the bottom of the screen (note: if responding with "Other", you will be presented with a section to enter your educational objective for taking the course). Please remember to click the SUBMIT button to submit your quiz response. 5. 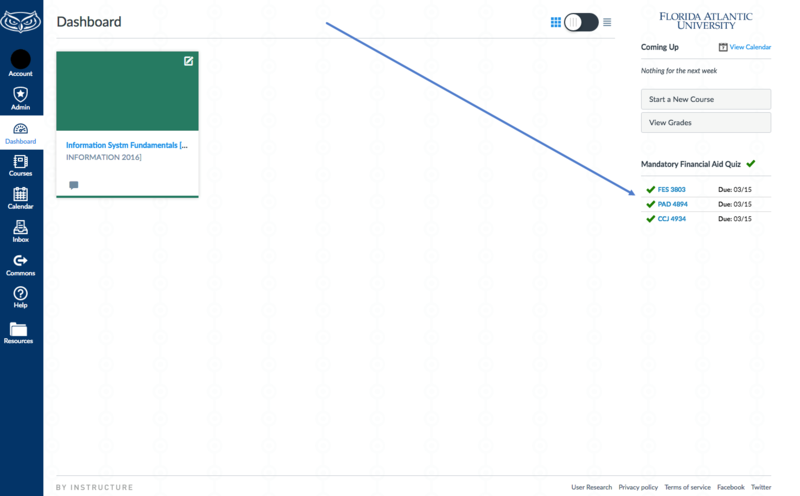 If performed correctly, the quiz status will be updated with a GREEN CHECKMARK on your Canvas dashboard page. 6. When all of your Course Entry Quizzes for the term have expired, they will appear in the lower right hand corner of your Canvas Dashboard. Course Entry Quizzes which you have not completed will have a RED "X" next to them. Financial Aid recipients who did not complete a Course Entry Quiz that has expired should contact their assigned financial aid counselor for advisement on alternative ways thorough which their course participation can be verified.